Quite a few articles on Jailbreaking are pre-OS3.0, which had me wondering if it was still even worth it to Jailbreak. It seemed like Apple listened, and finally brought some much asked for features to the iPhone. Without doing too much research as to if Jailbreaking was still necessary with OS3.0, the hobbyist in me decided to dive in and see what I could find. I won’t go over how to Jailbreak, as that’s a much covered topic. However, if you’re new to the world of Jailbreaking, and would like a great place to start, there’s a fantastic “How-To” over at Gizmodo. The whole process takes about 5 minutes, minimal knowledge of hidden files on your computer, and a couple of button presses. Very smooth process. Just make sure to create a backup in iTunes before you get to it. Once you’ve done the deed, you’re left with really no UI changes to your iPhone. You’ve simply been given a new App called “Cydia.” Think of Cydia as the App Store for Jailbreak Apps. It’s a cornicopia of programs to view and install that Apple never gave specific licenses to. Keep this in mind when a Jailbreak App decides to be stubborn and cause you to reboot or freezes up on you. The price of freedom and choice is not free. It’s a very smooth theme, not too intrusive, and I noticed that the creator took time to skin not just the iPhone default Apps, but a lot of the more popular Apps such as Pandora, Wikipanion, Remote, Facebook, and a few games that are in the top ten on the App Store. 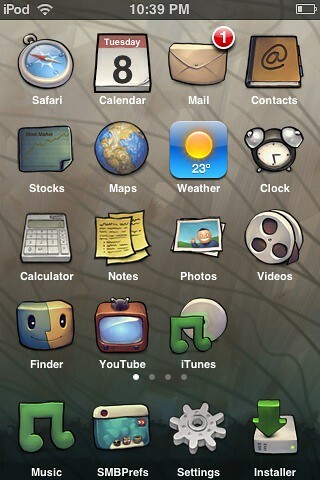 Winterboard also acts as a liaison between your iPhone and some additional extensions. One great extension is the 5 Column Springboard, which adds a 5th column to each page of your iPhone’s Springboard. It may not seem like a lot, but it really does help the user condense some premium screen real estate. It also helps if you’re a user who has over 4 pages of games — not me, of course…other users. One other extension, which I elected to NOT install, is Categories. I’ve heard great things about it. It lets you create a folder on your iPhone that houses like Apps, essentially letting you get all your apps on to one Springboard page, then opening the folder to choose the Apps inside. From reading the comments of users who have tried it, it seems to be very buggy with the new OS3.0 Jailbreak. I’m adventurous, but also busy; so, I’ll give this one a few months before I try it out. This is merely just a UI change, which isn’t really what I Jailbreaked (broke?) for in the first place. I was looking for extended functionality. The first App I downloaded was Cycorder. It effectively turns your iPhone’s camera into a video recording device. It’s not a solution to the 3GS’ video camera, as Cycorder records in the best of lighting conditions at an acceptable 15FPS. It gets the job done, when you have no video camera around. Cycorder would make a great addition to a teacher’s arsenal, as it’s right there, ready to go the minute a lesson is going swimmingly, or a student presentation is turning out to be of archival quality. Recording local videos on your camera is fine, but with the networking possibilities we have these days, sharing is the biggest draw in media. 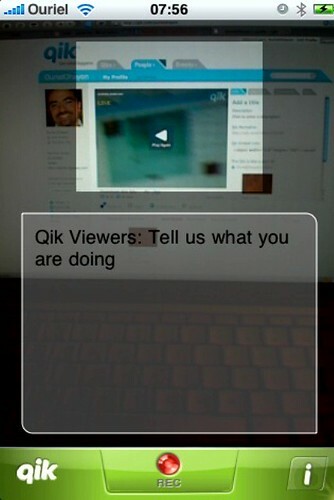 That’s why I went on to Qik. QIK is a popular video streaming service that seems to work natively on almost all 3G phones across all networks, except for the iPhone. I can only assume Apple kept this from happening so that they could eek out an extra million iPhone sales with the 3GS. There seems to be no viable reason for QIK to not be officially supported by Apple, given that the recording and streaming quality of this program on the iPhone is fantastic. Simple sign-up with an e-mail, and you’re given your own site (qik.com/username) where anyone can view your video as it streams live, or as an archive at a later date. QIK seemlessly saddles up next to your favorite networking sites, by allowing you to set it to automatically post to your Facebook and Twitter accounts when you’ve started a live stream. It will even embed in your web site for live streaming, or archiving. You’ll notice in the right sidebar of this site there is a QIK archive video. The quality is very much “You Tube”ish, but these days it’s not the video quality that counts, it’s the content that matters most. Create a QIK account for your class, send the link to other rooms, and have your class demonstrate a science experiment or deliver a presentation in real time, with viewers able to leave feedback for later review. BossPrefs – Let’s the user hide (but not uninstall) unused programs. Great for hiding the Stocks program! This may only appeal to me, but in Winterboard, you can set it up so that your iPhone makes a lightsaber sound when you slide the lock bar. I know, useless, but gives me a greater sense of worth as I swipe to play some Peggle. So, having gone into this with no expectation, or even an idea of if it was still a necessity, I can say that it is a must for anyone out there feeling like their iPhone is a B+ product, that should be an A+. The Jailbreaking community is very strong and vocal, so you get lots of support. If there’s a feature or extension of the iPhone that you wished existed, you can be sure that it’s probably already been created. There are other extensions and “packages” that I played with and didn’t get into here. For most, it’s because they were too buggy to recommend. As they become more stable and useful, I’ll update my thoughts on them here.